Evan Wilson is fascinated by the intricate handiwork and details that make antique kimonos and other textiles so beautiful and interesting. 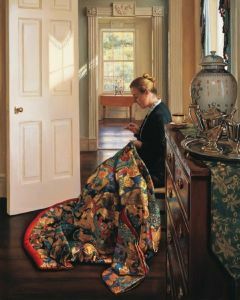 In this image, a young woman sits quietly in the soft light coming through the window as she gently hand-stitiches a repair to a kimono. The amazing patterns and colors in this fine garment are the result of many hours of craftsmanship that are rarely duplicated today.